If the intranet is to become the “natural” way of working, it is essential to have the active involvement of all key players in the organization. 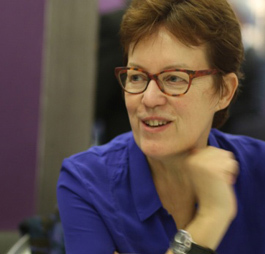 This requires defining a governance framework that mobilizes high-level stakeholders. It also requires people in the intranet management role to be more aware of the big picture and to work at a more strategic level. This post shares four facts about governance in the workplace web where the intranet, collaboration and social merge. 1. Senior management is not yet sufficiently involved. In only 12 % of the organizations, top management sets intranet-related objectives for their management teams. In fewer than half the organizations, high-level stakeholders (Directors of HR, Communication, IT and other support functions) are expected to deliver their services to employees using the intranet. 2. Social media management is a new role in the organization. 40% of the organizations have social media responsibility, internal and/or external, included in one or more job descriptions. It is usually one responsibility among others. 3. Governance models are beginning to converge responsibilities for intranet, collaboration and social media. 50 % of the organizations include responsibility for internal social media in the intranet management role. 30 % include both social media and collaboration. 4. 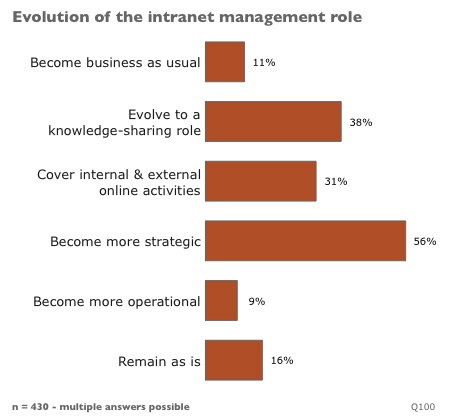 The intranet management role is evolving. Fortunately, most of the survey respondents see the future of the intranet management role as evolving to a more strategic level.